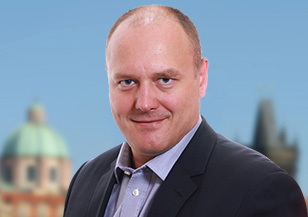 David Šita is a consultant based in Spencer Stuart’s Prague office and a member of the Technology, Media & Telecommunications, Industrial, Energy and Private Equity practices. With more than 10 years in senior leadership positions, including the role of CEO, David brings to his clients in Central and Eastern Europe firsthand knowledge of the demands faced by senior executives across industries. Prior to joining Spencer Stuart, David served as CEO of GTS, a private equity-backed telecommunication company recently acquired by Deutsche Telekom. David served in a variety of executive roles at Telefonica O2 Czech Republic, most recently as vice president of the top corporate and public companies division, where he managed operations for the 300 million Euro division. During his tenure, he redefined the organization’s information and communication technology (ICT) strategy and created a new solutions portfolio. Previously, David was a project manager with GE Capital Bank (now GE Money Bank), where he managed back office and customer service call center operations, as well as led the consolidation of bank branches. Earlier, he was a director with Lepton, a registered broker, where he analyzed capital markets, planned new products and managed risk profiles. In addition, he co-founded Damax, an import-export trading and transportation company. For 11 years, David served as a board member of the ICT union in Czech Republic, the largest association of IT and telecommunications companies in the country. He previously chaired the board of a nonprofit organization that served disadvantaged children. David holds a master’s degree in economics from University of Economics, Prague, and an M.B.A. from Rochester Institute of Technology. He also is a faculty member at the Czech Technical University, where he lectures on electrical engineering.